75164 Rebel Trooper Battle Pack is a Star Wars Rogue One set released in December 2016. and will be released in March 2017 in the United States and Canada. Patrol and defend Rebel territory! Expand your army with the Rebel Trooper Battle Pack. 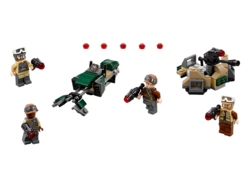 Featuring a speederbike with stud blaster storage clips and space for a minifigure, plus a trench section featuring a multidirectional laser cannon with stud shooter and extra ammo, this great set makes the perfect addition to any LEGO® Star Wars collection. Includes four minifigures each with a stud blaster. 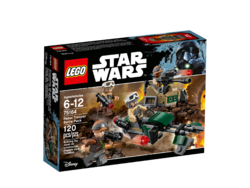 Features a speederbike with stud blaster storage clips and space for a minifigure, plus a trench section with a multidirectional cannon with stud shooter and extra ammo. Jump on the speederbike, grab your stud blasters and get ready for action! Man the stud-firing laser cannon and prepare for battle. Weapons include the Rebel Troopers' four stud blasters and extra ammo. This set offers an age-appropriate build and play experience for ages6-12. Play out action-packed scenes from the blockbuster movie Star Wars: Rogue One. Combine with the 75165 Imperial Trooper Battle Pack for epic Star Wars: Rogue One encounters. Speederbike measures over 1” (3cm) high, 4” (11cm) long and 1” (4cm) wide. Trench section measures over 1” (5cm) high, 3” (9cm) wide and 2” (7cm) deep. Facts about "75164 Rebel Trooper Battle Pack"